It’s been a great summer for Minnesota Midget melons, a small cantaloupe-type melon that grows very well in the North. I’ve got three Minnesota Midget melon plants, all growing in containers and all doing great. So great, in fact, that I’ve been looking for ways to use them, including the cooler recipe you’ll find at the end of the post. 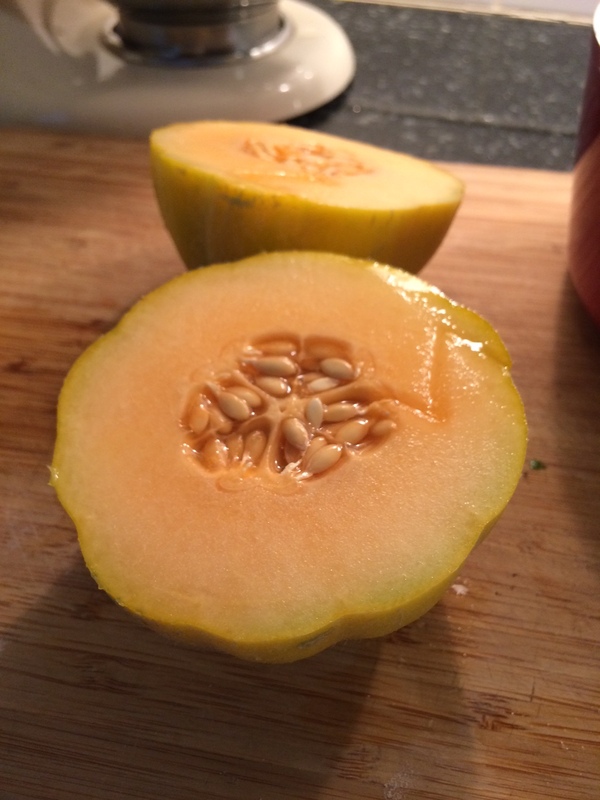 Minnesota Midget melons are small but tasty and grow really well in northern climates. Minnesota Midget was developed at the University of Minnesota and introduced right after World War II. I can’t help but wonder if the melon was developed in part to encourage owners of smaller properties to plant Victory Gardens. While researching the vegetable chapter of The Northern Gardener: From Apples to Zinnias, I read several pamphlets from the U on growing vegetables in very small spaces: they called them “rug gardens,” because you could grow a lot of food in a 9-by-12 space. But that’s another story. Minnesota Midget melons grow on relatively short vines—mine are about 3 to 4 feet long, though the longest vine may be 5 feet. They flower profusely, and then set fruit. Each of the vines I have has 4 to 8 melons on it, varying from the size of a softball to just-a-bit smaller than a grocery store cantaloupe. When they are ripe, they separate easily from the vine. You should try to harvest before they fall off the vine, so right now I’m doing daily inspections to remove any melons that are getting ripe. This year, they have not been hard to grow at all! I started the seeds indoors and set them in their containers in early June. The vines took off. Like all melons, they like sun and a relatively rich, well-drained soil. Because they are in containers, I’ve been checking to make sure the melons are all supported well. I had to sacrifice a pair of pantyhose to rig up supports for a couple of them. 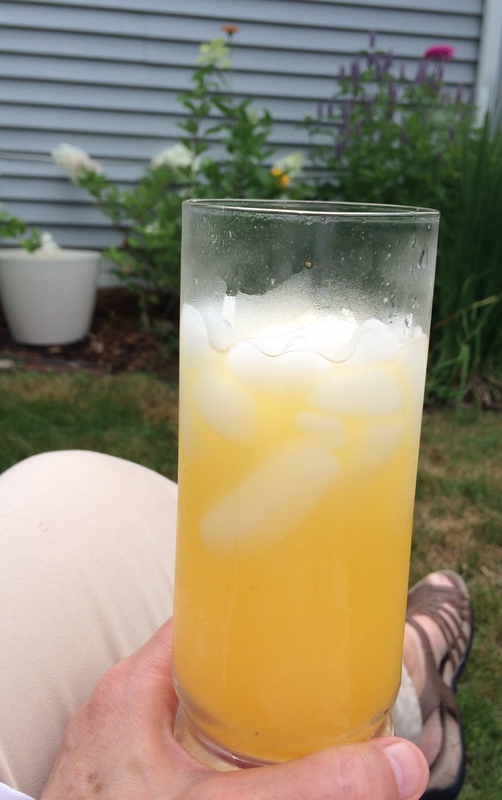 Enjoy a refreshing melon cooler in the garden. This recipe is a modification of one I found in Amy Thielen’s The New Midwestern Table, which is a fantastic cookbook full of good stories and delicious recipes. Put the sugar and water in a pot and bring it to a boil to dissolve the sugar into the water. While it’s heating up, remove the zest from the three limes (I peeled it off with a vegetable peeler) and peel and slice the ginger. When the water is heated, take it off the heat and put the ginger pieces and lime zest in to soak. Let the water cool. When the water is room temp, juice the lime, and seed and remove the flesh from your melon. Put the sugar syrup (with the ginger and lime pieces), the lime juice and the melon flesh in a blender. Give it a whirl until it’s smooth. You may want to strain the resulting mixture through a sieve. To serve it, put about 1/3 cup of the melon mixture in a tall glass with ice and top it off with fizzy water. I’m not a hard-liquor person, but if I were . . . This recipe is not set in stone: Make it more or less sweet depending on your taste, add more lime, more melon, more ginger, depending on what you like and what you have on hand. Add some mint leaves to the infusion or anything else that strikes your fancy. My melon was small so I added a bit more flesh from another melon to give the drink enough melon taste. Feel free to adjust and enjoy! Havent grown these yet but I like the idea of them. I tried growing watermelons last year and the squirrels got into them. Will I have a similar problem with these? Possibly. I’m growing mine in containers, one of which is fairly tall, so the fruits aren’t easily accessible and none of them have been bothered by squirrels (unlike my tomatoes). Squirrels are way too clever!